Come autumn and several cities across India get into a frenzied mood to celebrate one of the biggest festivals of the country, yes, Durga Puja. With extravagant stage décorations called pandals, dance and music, processions, cultural events, and of course, non-stop food and shopping, this multi-day festival breathes a new life into cities and the people therein. To put simply, you don’t just ‘celebrate’ this festival; you experience it! 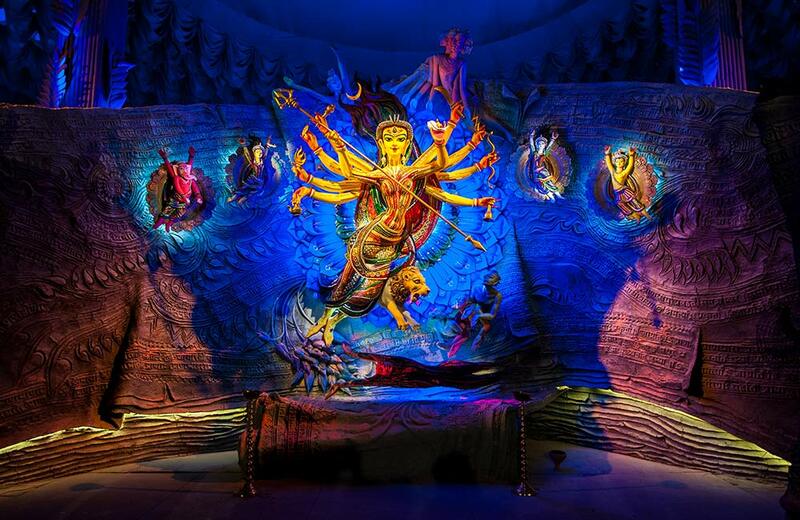 And here’s our guide to help you experience Durga Puja at its best this season. Looking for budget hotels? Click here to find the best deals in cities all over India. Durga Puja 2018: What Is It? As the name suggests, this annual festival reveres Goddess Durga and marks her victory over the deceptive and shape-shifting demon Mahishasura in a fierce battle. That’s why she is also known as Mahishasura Mardini (the slayer of Mahishasura). As such, the premise of the festival is religious. However, Durga Puja is not limited to being just a religious fiesta. It is also celebrated as a post-monsoon harvest festival in some places, where the Goddess is worshipped as the mother-power behind all creation and life. The dates of Durga Puja coincide with that of Dussehra or Vijayadashami, which marks Lord Ram’s victory over Ravana. Unsurprisingly, you can often find a mix of these two traditions in the festivities across India. Durga Puja is celebrated in the month of Ashvin as per the Hindu calendar. According to the Gregorian calendar, the date usually falls between September and October. In the year 2018, the festival starts on the 10th and ends on the 19th of October. 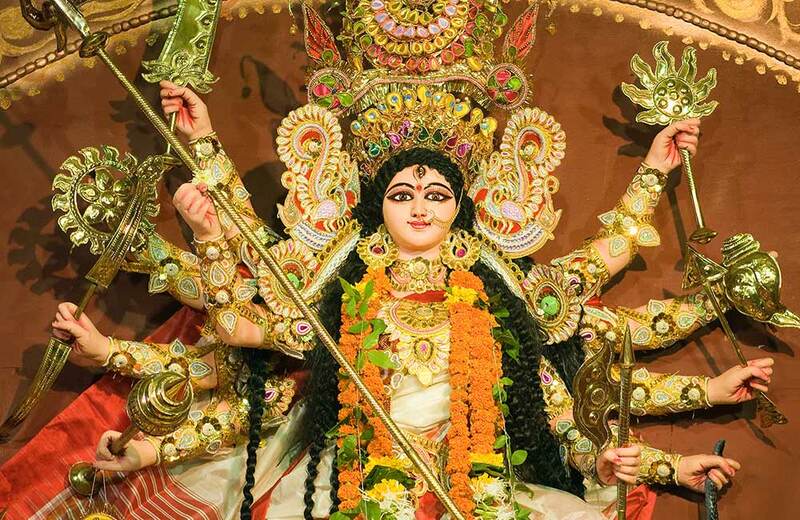 First Day: The festival begins on Mahalaya, the day on which the goddess is invoked to descend to earth for her yearly visit to her maternal abode. Highlights: It is also the day on which the Hindus pay homage to their ancestors. Sixth Day: The next important day is the sixth day, which is known as Shashthi. This day signifies her arrival along with her children, namely Lakshmi, Saraswati, Ganesh, and Kartik, on earth after her long journey from Kailash, her abode in heaven. Highlights: Community pandals mark the day, where huge idols of Durga holding weapons in her ten hands, her four children, and Mahisasura are placed. Seventh, Eight, and Ninth Days: The next three days are known as Saptami (seventh day), Ashtami (eighth day), and Navami (ninth day), and they are the most significant days of the festival. On these three days, the goddess is worshipped by observing various rituals and recitation of the scriptures. Highlights: Attractively décorated community pandals draw in huge crowds during these three days. People don new clothes and indulge in pandal-hopping, eating out, and making merry with their friends and families. With performance art shows, competitions, processions, it is nothing short of a carnival feel during these days. 10th Day: Dashami is the last and tenth day of the festival when Durga is believed to start on her return journey. Highlights: This day also marks the end of the festivities with the immersion of the idol in a river or a large water body. Huge processions are taken out on Dashami as people accompany the goddess to the waterfront to bid her farewell in a vibrant manner. 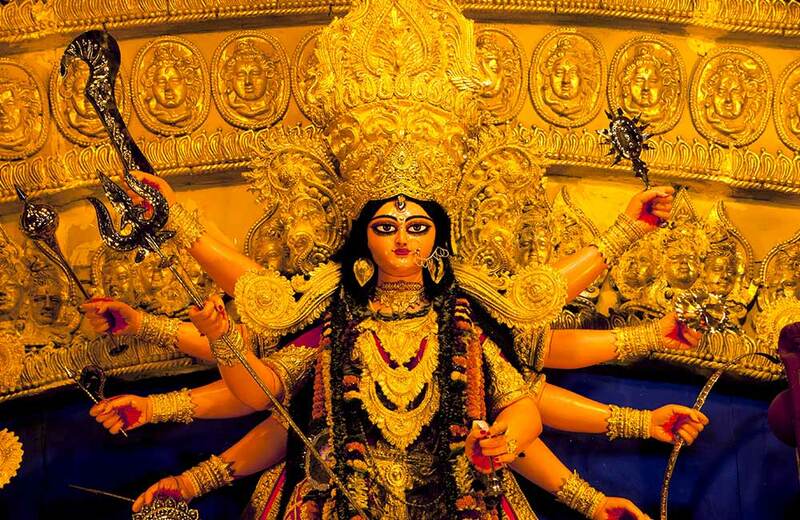 You can find a different flavor of Durga Puja in different cities and towns of India. The celebrations, activities, food, and customs all differ, from one place to another. Let’s take a look at some of the best places to visit during the festival this year where you can soak in festivities and shop and eat to your heart’s content. If it’s Durga Puja, there can be no better place than Kolkata to soak in the festive spirit. The City of Joy is the place where you can witness the highest degree of grandeur and frenzy. Hundreds of elaborately décorated pandals, fascinating illuminations, magnificent idols of Durga, and appetizing food options, all turn Kolkata into a fantasy land during the days of the festival. Go pandal-hopping from the north to the south of the city, checking out the traditional pujas as well as the modern theme-based pujas. Do not miss out on visiting the Baghbazar Sarbojanin puja that is completing its 100 years and has organized a number of musical events to mark the occasion this year. Remain witness to the spectacular traditions followed at one of the Bonedi Bari (aristocratic family) pujas in the city. Dig into mouth-watering items from the food stalls at Maddox Square. Take part in sindoor khela on Dashami at Chalta Bagan Lohapatty Durga Puja where even the Tollywood beauties come down to be a part of the celebrations. Durga Puja in Mumbai has a vibe of its own. Though the traditions followed here are quite similar to those at Kolkata, yet there’s a touch of modernity to the whole feeling of celebration. With more than a hundred pandals dotting the city’s landscape, you can have a great time pandal hopping in Mumbai and enjoying the gala spectacle. Make sure to visit the pandals in Powai, Lokhandwala, Shivaji Park, Andheri, and Chembur. Visit the Balkanji Bari Durga Puja in Santa Cruz to not just get see the deity’s idol but to get a glimpse of a few matinee idols as well. It’s the household puja of the Mukherjee family where every year Kajol, Rani Mukherjee, Tanuja, and other members of the family gather for the festivities. 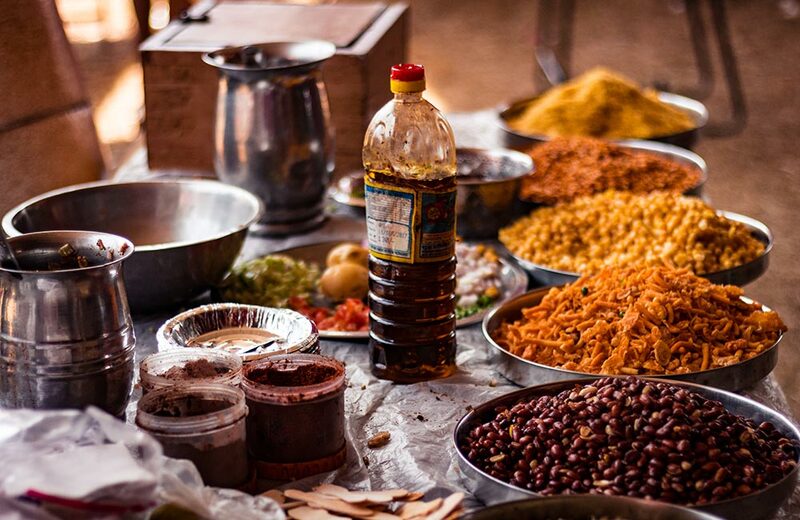 Enjoy the authentic khichuri and labra at the Thakur Village Durgotsav in Kandivali. Durga Puja in Delhi is more about celebrating Lord Rama’s victory over Ravana. An interesting part of the celebrations are the Ram Lila performances held during this time, in which scenes from the Ramayana are enacted. But the best part is the burning of Ravana’s firecracker-stuffed effigies along with those of his son Meghnad and brother Kumbhkaran. But the city comes up with some spectacular pandals as well where the goddess is ritualistically worshipped during this period. 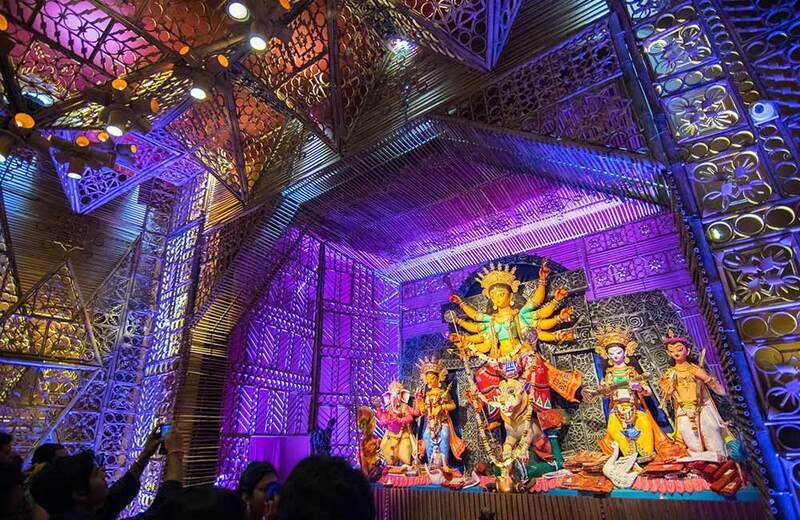 Check out the Kashmiri Gate Durga Puja, which is the oldest one celebrated in the capital. Attend the Ram Lila performances and Dusshera celebrations at Ramlila Maidan Ajmeri Gate and Red Fort Ground. Head to Chittaranjan Park and gorge on some delicious Bengali delicacies. Enjoy concert-style performances by artists from Hindi and Bengali entertainment community at New Delhi Kali Bari. The entire city of Guwahati lights up with a festive vibrancy during Durga Puja. Around 500 community pandals are set up to celebrate the occasion. You can find impressive idols of the goddess placed inside theme-based pandals dotting the length and breadth of the city. Exhibitions and fairs are held at different parts of Guwahati during this time. Spend the night pandal hopping across the city. Do not miss checking out the Kamarpatty Sarbajanin Durga Puja at Kamarpatty area where a giant asura is the main attraction every year. To get a good dose of live music, food, shopping, and a heightened festive spirit, head to the Geetanagar field and Rest Camp, Pandu. 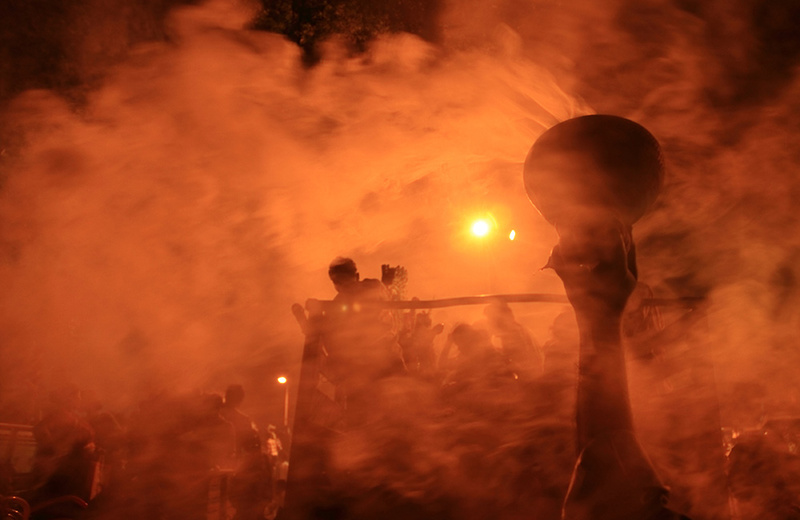 The holy city of Varanasi awakens with a magical vibe during Durga Puja celebrations. Large pandals come up in different parts of the city where the goddess is worshipped with unmatched fervor. The city also celebrates the occasion to commemorate the victory of Lord Ram over Ravana. You can see small children dressed up in various characters from the Ramayana enacting plays during this time. Make your way to the famous Baageshwari Devi Durga Puja Samiti at Jaitpura that comes up with a surprise theme every year. Attend a couple of drama sessions enacting episodes from the Ramayana. Enjoy the cultural programs lined up for every evening at the Bhelupur pandal. Attend the immersion ceremony of the idols in the river Ganga on Dashami. It’s impossible to miss the festive fervor that grips Ahmedabad during the Durga Puja and Navratri celebrations. The whole city decks up with lights, colors, and festivities. Ahmedabad celebrates the occasion to commemorate Lord Ram’s victory in the battle against Ravana. 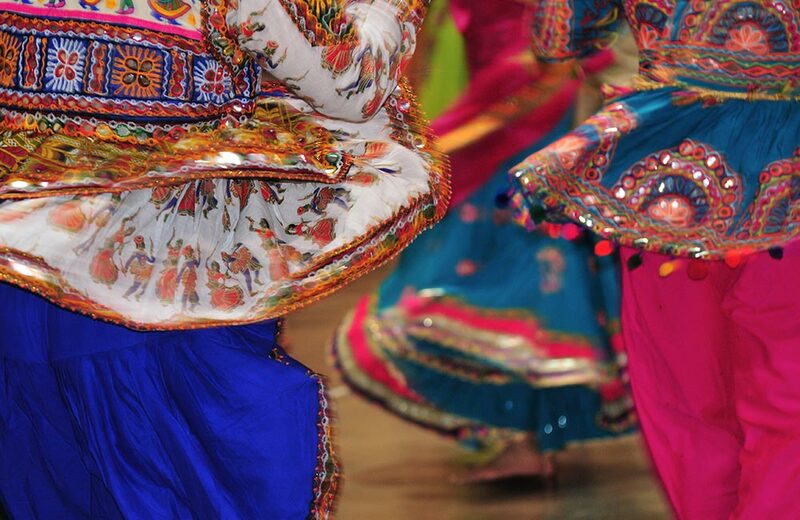 Dance, drama, and songs fill the air during the nine days of Navratri. People dress up in their traditional best and take part in Dandiya and Garba Raas performances. You can also find puja pandals where the goddess is worshipped in her Durga form. Wear a traditional outfit and match your steps at the dandiya event organized at Navakhi ground, Laxmi Vilas Palace. Attend the cultural events organized by the Bengali Cultural Association (BCA). Get a taste of the authentic Gujarati cuisine. The best thing to do during Durga Puja is, of course, visiting different puja pandals to see the goddess and the pandal being presented in unique ways. We bring to you the top ten pandals from across the country that you must not miss out on visiting this year. Living up to its reputation of enthralling puja revelers with amazing pandal décor, Sreebhumi Sporting Club in Lake Town has come up with a pandal that mirrors the palace of Rani Padmavat. The pandal and the idol, both are grand spectacles that you must not miss out on. Each year an incredible spectacle awaits the visitors at the Deshapriya Park Durga Puja near Rash Behari Avenue in South Kolkata. No wonder, people from far off corners of the city come to see this pandal. Known as Bollywood singer Abhijeet Bhattacharya’s puja, the pandal here is among the most popular ones in Mumbai. Various performances, events, and an array of food stalls keep the crowd glued to this place. Organized by the Powai Bengali Welfare Association, this puja is known for its eco-friendly pandals. The Dhunuchi dance competition is a very popular event at this puja. Counted among the oldest Durga pujas celebrated in Delhi, the Kashmere Gate puja draws in the crowd based on their grand pandal décor and beautiful idol of the goddess. The theme décor at Baageshwari Devi Durga Puja Samiti each year is a delight that never fails to impress visitors. 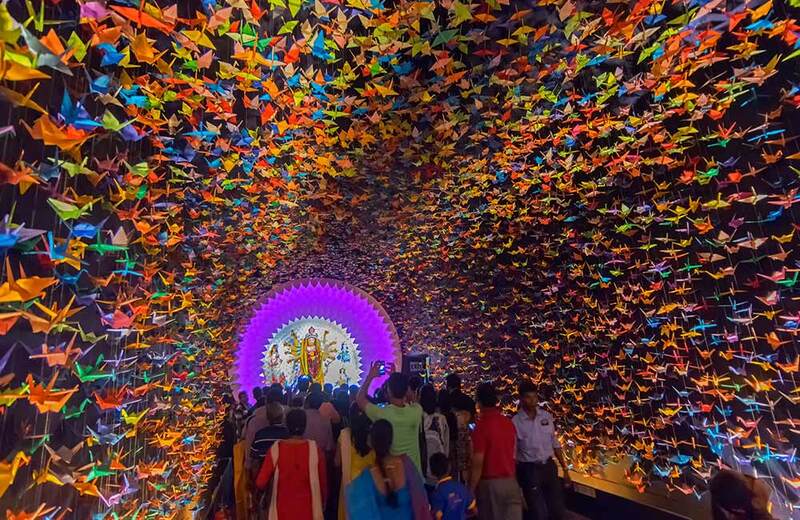 If you happen to be in the city, make it a point to visit this pandal. Located in the heart of the city, the Athgaon Sarvajanin Durga Puja has been entertaining the people of Guwahati with their unique theme-pandals for quite a few years now. They put up their first puja pandal way back in 1942. Today it is one of the most popular pujas of the city, thanks to the impressive décor of the pandal and the organized arrangement of food stalls and eateries. This puja, organized by the South Madras Cultural Association, is undoubtedly the most popular one in Chennai. Starting from Anjali and bhog during the day to cultural programs in the evening, you can experience everything here. Though this puja was started just over a decade ago, it has made a place for itself among Punekars. Famous for its splendid décor and lovely Durga idol, the puja pandal also acts as a hangout zone where you can enjoy the best of Bengali cuisine and buy handicraft stuff. The list of the best Durga Puja pandals can never remain confined to a handful. To enjoy the real zeal and fervor of the festival, start your trip from Kolkata before you go about discovering the other cities and their pujas. Or, you can save the best for the last and start with some other city as well, the choice is all yours. Here’s wishing you a very happy Durga Puja! !